Do you want your garden or patio to look modern and stylish? Here are a couple of examples of how Coolashade can transform your property! For more information and to arrange a quote get in touch today! Coolashade Shade Sails are the specialists in the supply and installation of Shade Sails in Spain, covering the Costa Blanca North including Javea, Moraira and Calpe. Coolashade Shade Sail Installation Costa Blanca manufacture their own range of Shade Sails and are available to the whole of Spain and Europe, manufacturing purpose made sun shades to suit any size or dimensions and have many colours to choose from. Shade for your Patio, Terrace or BBQ area. Shade for your Pool, Car or Children’s play area. Shade for commercial use including restaurants, bars & public areas. Coolashade Shade Sails have been installing all over Spain an Europe for many years and we have a team of professional installers serving the whole of Spain. Please be assured that all Installations are undertaken by Coolashade partners who have been specially trained and all Warranties and Guarantees are the same. 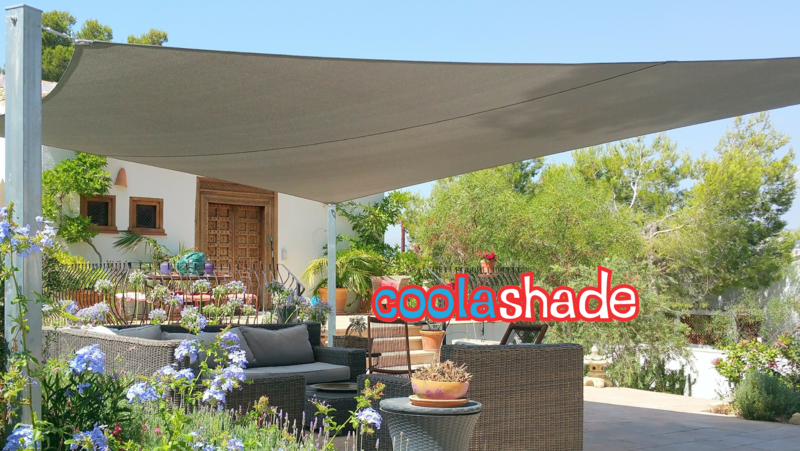 Coolashade Shade Sail Installation Spain – a name you can trust!